Having Babies and Having Fitness Too! Getting set to return to work next week has got me thinking about balance. How am I going to balance work with family time? Or family time with household responsibilities? Or household responsibilities with social commitments? Or social commitments with sleep? Or sleep with fitness? The answer is I will. I have to. The obvious variable to cut out of the above equation to buy myself some more time is fitness. But that’s not an option. Because it is fitness that fuels me and allows me to be more productive in all other areas of my life- in work, family time, household responsibilities, social commitments, and sleep. It prepared my body to have a healthy baby. I went into this pregnancy last year being fitter than I’d ever been and I maintained my fitness via modified Crossfit workouts throughout my entire pregnancy. When my body said use lighter weights, I used lighter weights. When my body said slow down, I slowed down. When my body said drink water, I drank water. And when my body said rest, I rested. It supported me through labour and delivery. I was strong on March 2nd when my daughter decided to make her appearance. My labour lasted only three hours and was unmedicated; it was my fitness that assisted my body’s ability to cope. It helped me recover from her birth. I was back at My Gym four weeks after she was born, and I was feeling healthy, strong, and empowered. It allowed me to set an example for my kids. My kids are learning that their bodies need movement to be healthy. It gave me a sense of community. I saw my friends. I laughed. I smiled. I had fun. Fitness is non-negotiable. Being fit makes me a better me. And a better mom. And a better wife. And next week, a better chiropractor. 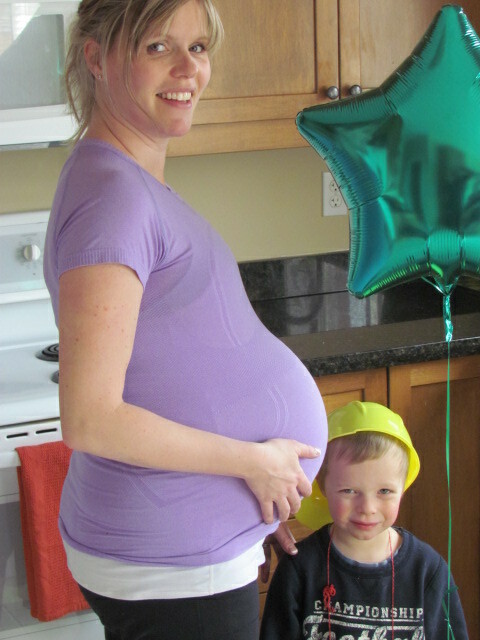 Drew and I did a backyard workout on my due date; 52 belly-to-ground burpees at 40 weeks pregnant. This entry was posted in Fitness, General Health, Parenthood. Bookmark the permalink. Glad you liked it! My contact details are on my ‘About Me’ page (http://wp.me/P2q4AV-2), and you can reach me by email at drashleyworobec@gmail.com. The obvious variable to cut out of the above equation to buy myself some more time is fitness. But that’s not an option.